Every new year brings a new opportunity to “start fresh” and get something done that you might not have accomplished in the previous year. As we look ahead to 2015, we start to think about our legal technology resolutions for the coming year. There are often new technologies for lawyers that did not exist in the previous years and new ways of automating or organizing their lives. What are some specific, measurable, actionable, and realistic legal tech goals that can be made for the coming year? 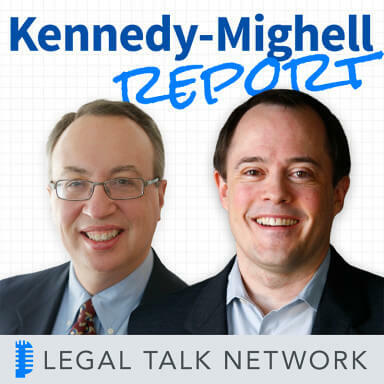 In this episode of The Kennedy-Mighell Report, Dennis Kennedy and Tom Mighell discuss their personal legal technology resolutions for 2015, how to get started making your own technology resolutions, and how last year’s resolutions have turned out. The hosts first suggest some general resolutions including turning on Find My iPhone, going paperless, using a password manager, and backing up in 3 different ways. They then talk about their own resolutions. Kennedy aspires to prune down his data intake from things such as podcasts and rss feeds, look into automating as many repetitive tasks as possible, revisit old systems which might be improved by 2015 technologies including the cloud, broadband access, increased storage, or processing power, and to simply try something new. Mighell is looking to learn new Microsoft Office skills in Access, Excel, and Project, start creating more content for his blogs, try a new platform with Microsoft Surface Pro 3, and also automate repetitive tasks using If This Then That and other tools. Both hosts express that it is important for lawyers to increase their technology experience each year and resolutions are a useful way to structure and inspire new learning. In the second half of the podcast, Kennedy and Mighell review and analyze the legal technology resolutions they set for 2014. Mighell wished to learn about his new Mac and be able to work on multiple platforms and get his certification in privacy. Kennedy aspired to revamp his website, become a successful Evernote user, and take his backup to the next level. Tune in to hear whether they achieved their goals. Dennis Kennedy: And welcome to episode 143 of the Kennedy-Mighell Report. I’m Dennis Kennedy in St. Louis. Dennis Kennedy: In our last episode, we give you our takes on this year’s developments in legal technology. Colorless, not overly-impressed, but we are always the optimists. The start of the New Year is a time for making New Years resolutions and there’s no better place for 2015 resolutions than technology. And we’re here to help with that and to unveil what’s on our own list. Tom, what’s on our agenda for this episode? Tom Mighell: Well Dennis, in this edition of the Kennedy-Mighell Report, we’ll be discussing our legal tech resolutions for 2015. In our second segment we’ll revisit our 2014 technology resolutions or some of the things that worked well for us and talk about the 2014 resolutions that we actually accomplished. As usual we will finish with our parting shots, that one-tip website or observation that you begin to use the second that this podcast is over. But first let’s get started on our initial topic, our first segment: 2015 legal technology resolutions. Each year, around this time, people start talking about getting a fresh start to the New Year, looking at it as an opportunity to get some things done that for whatever reason they were not able to accomplish in the previous year. Over the past few years we have tried to do that ourselves but from a technology standpoint and to encourage our listeners to do the same as well. Dennis, it seems like at this time of year a lot of people make their annual legal tech predictions to see what’s coming in the year ahead. I’m really no good at predicting which is why I prefer to talk about resolutions. Why do you prefer to talk about resolutions rather than predictions? Dennis Kennedy: You know I used to do an annual predictions article every year on legal technology and I gradually stepped away from that because I think that predictions in some ways are there less interesting than the resolution-type thing, so there’s a notion of accountability that comes in to play with the resolutions. I also like the idea that you’re taking what you think is coming with technology or what you see has happened and turning that into action, and I think that’s important. I also think with predictions, if you make enough predictions, you’re bound to get one or two that’s right. So that’s interesting because as we’ve talked in the last episode, it doesn’t feel like there’s a huge amount going on in legal technology, so the predictions you would make for next year probably aren’t that different than you would make for last year or maybe in the year before. So that’s why I prefer the resolutions notion, and I think it really comes down to what can I do based on what I’m seeing that I can actually take action on. Tom, what makes for a good technology resolution do you think? Tom Mighell: Well you know when I usually think about that, I think about when we look at goals and especially when we do strategic planning, things like that, we look at those SMART goals which is specific, is it measurable is an actionable is it realistic and is it timely. And I think that’s a good place to start with when looking at your resolutions because the resolution is really a goal to set for the year. But frankly, if I’m looking at all of those, for me I think that realistic is probably the most important part for lawyers because I think that a good technology resolution needs to be just time-consuming enough that it will feel like you’re really accomplishing something, but not so time-consuming that a lawyer is going to put it off to do more important things, because the biggest enemy of not getting resolutions done when it comes to technology. I just didn’t have the time to get around to doing that sort of thing. So there’s got to be some pain and some discomfort in it; you’ve got to put some time into it. But it can’t be so much that it takes the place of everything else that a lawyer needs to get done in a real job and the money that they need to make to make a living. To me that’s the most important goal of that SMART goal setting of principles. What about you Dennis? Dennis Kennedy: Well I think that (RP’s) realistic results-oriented but I think that the notion where you’re saying, “I’m looking toward an achievable result,” and what’s that going to mean: I think there’s is a notion of small versus large, so when we talk about resolutions I think you think of something that’s a little bit different than a goal, although there is some similarity to that. Also think of this: I think what sometimes people fall down on is not seeing this as a process and I know that’s part of what I’m going to talk about on the podcast. And I look at some of the things I’ve seen out there and some of them just seem too small and some of them seem too big. So I think finding that right range where you say, “What’s the result I want to achieve, what are the steps I’m going to take and can I tick those steps off to get to that result that I really want from this?” The other question I have, Tom, is sometimes you think about and when I look at the list and when we look at things we’ve done in the past, is if you look at a process you don’t feel that bad about saying, “Hey, I didn’t make the one from last year, that doesn’t mean I’m a failure or that it’s gone, it’s something I can keep rolling forward and keep moving toward. So I think that repeating the resolutions is not a bad idea, even though you might feel a little bad about that. Tom Mighell: It’s funny because in my personal life, I will set personal goals for fitness and eating better and losing weight and all sorts of things, and I will say that I tend to repeat that every year with not as much success as I would prefer there to be. I think that you talk about small versus large – I know in the show notes you put in an article from Time that talked about technology resolutions and I was looking those, and it’s funny because those are fairly general resolutions. To me they were kind of broad, I think that you may have thought that they were kind of wimpy. But I have to say that I look at them – and I’m going to put these in the show notes because I think it’s kind of interesting as an example of technology resolutions – a lot of these are things that if people do them, they could eliminate a lot of the technology problems that they have. I just wrote down the ones that I thought were interesting. Turn on Find My iPhone handles a huge security issue, granted it takes 5 minutes. But what about that feeling of accomplishment after the 5 minutes when you turn around? Going paperless takes a lot longer than 5 minutes but it’s something that should be achieved. Using a password manager is an ongoing process, but I think it’s really important and then backing up in three different ways. I think those are all worthy goals to achieve and and I think that sometimes for these things, I think that we’ve got them managed – at least I feel that I have them done. But I’m constantly surprised at the number of people who aren’t doing a lot of those simple, basic things. So I’m going to be an advocate here; some of your resolutions can be start-small. Have some small steps, some small wins to get started so you can feel like you did accomplish some things during the year so I don’t really think there is a “too-small,” I think it’s a matter of whether they make sense for you. Dennis Kennedy: And I think that the exemptions you gave illustrate some important points about the notion of resolution. So sometimes you can say, “Oh, this feels really like a small thing,” like you said that turn on the Find My iPhone. But if it’s accomplished, you’ve taken a pretty big step. There are other things like you said, like “be more paperless,” which probably tons of people have on their list. And you’re kind of like, “Well, I don’t know; did I achieve it or not or am I making progress towards it,” or doing a better job with passwords. Those tend to be really big whereas I think -just to use a password example – if we say, “Hey, if what I do is I make sure in January that my first step is going to be to find all of my main accounts where I’m using the same password and make sure that I get those passwords changed so I don’t have the same password on two major accounts,” that’s a huge step; and then the next step of employing the password manager to changing 3 more passwords after that, by the end of the year you’ve really accomplished a lot. So I think that it partially is a way to have a big enough vision for what you want to accomplish but then to be able to say, “How can I turn it into steps,” and I think, Tom, when we go to our lists – and maybe I should just start – is that my first resolution is exactly an example of that; of a big vision. Whether it’s something I achieve or not is going to be how I break it down into steps. So do you have any other comments or would you like me to launch right in? Tom Mighell: Well the only thing I’d say is that I think that’s part of the measurability of the goal and as I’m thinking about it I’m looking at some of my resolutions and I’m realizing that getting to that metrics level, going paperless, might be very vague; but saying that by the end of the year I’d like to reduce the amount of paper by X percent, or I’d like to be able to say that I’m I’m doing this now totally electronic. So the goal needs to be redefined so that it is measurable. And that’s how I prefer to look at it, I don’t think it makes it a goal worth having, it’s just a matter of redefining the goal. With that, I think I’m ready to start talking about resolutions; do you want to start off? Tom Mighell: My first resolution – actually, you and listeners may be surprised that I’m going to be using the word Microsoft a lot more during my resolutions than I probably expected to when I sat down to think about what my resolutions were going to be. But I typically take on as a resolution every year learning more about something. And this year will be no no different, and it’s really coming through more of a need, but I’m finding that there will be benefits for this learning on the outside and that is that I really need to learn how to better-use some of the lesser-used tools in the Microsoft Office or what Microsoft does. Specifically Access, Excel – that’s not necessarily unused but what I’m talking about is – and Microsoft Project. Part of the key of technology audit that now has blossomed into its own project, is it includes a better use of Excel and it asks how lawyers use Excel. And I think I know how to use Excel well enough to pass the tech audit, but there’s a lot of things in Excel that I don’t know a lot about; for example, just creating pivot tables to display or manipulate data better, something I would wager that a lot of lawyers don’t necessarily know a lot about how to use Excel for that. I’m also finding that Microsoft Access is really a worth-while tool for storing information. You may have a lot of related information that’s too hard to keep in a standard spreadsheet, and finding ways to slice and dice that information and put it into an easy-to-read report is just not as easily done in Excel as it is in Access. And Access is a great tool for just not only storing this information, but also for providing those customized reports on the information and I think in just about any way imaginable. And I had some specific uses for databases in the coming year, both for work and for personal life that I’m going to be using as my template for how to learn to use Access better. And then finally, I really need to learn how to use Microsoft Project better. In my business, as a consultant, I probably work with project plans more often than lawyers, because that’s how the companies that I work with are dealing with things. But we’ve discussed this many times on the podcast – a lot of legal work is project-based. There’s a ton of great project-management tools out there, and Microsoft Project is probably the most complete in terms of functionality. But I think that learning a project-management tool is a worthwhile goal, whether you do it this year or some time in the future. Dennis Kennedy: Yeah, I think that’s a great resolution, Tom. When people say that they want to learn programs like that, I also think it’s important to identify a project that you want to work on and then as we talk about that result that you want, so if you say if I’m able to create a database that does X in Access, then I will have satisfied that resolution. So I think that’s another way to help frame people frame. So my resolution number two – in an odd way – grows out of pruning, and that’s automation. So again, the big idea is to figure out what kind of steps will I take to focus at and to come up with some results that I want. So for me, I want to identify, because I have this vague feeling that I’m doing a lot of stuff that’s incredibly repetitive. Typing the same things over and over again, when we do the scripts for this show, there’s a number of things where I go, “I just do the same steps over and over again. I wonder if I’m doing them so often that it makes sense to look at a tool that will automate some of those things.” And it could be if this then that – the web service we’ve talked about to say – maybe if I mark something to be saved in Feedly, will automatically go into Evernote, or will do some other things, or if I post something in social media in one place, will automatically post someplace else if I put something in a file-folder, will it automatically do those sort of things. So I think there’s definitely a couple of steps to this process. So the main thing I think is to find the things that are being repeated, and repeated often enough that it makes sense to either look for a way to automate those, or the idea of automating them become so interesting that it allows me to try an automation tool. So an example might be document assembly, it might be if this then that, or stuff like that, and then to investigate probably one of those tools and to say, “What gives me some good bang for the buck where I can experiment with a form of automation that’s fairly simple to do,” but I’ll see some benefits as we’ve talked about that specific, measurable, achievable, types of benefits that I can look at and say I’ve accomplished this and I’ve learned enough as I’m going along that I can take the next step and maybe automate some other things. So automation would be my second resolution. Tom Mighell: Well I’m going to cheat, and I’m going to second your resolution as my second resolution. I also wanted to make more use of automation in the coming year so I’m just going to get onto the back of your resolution and second that. I think that my way of approaching it is a little bit different because I probably have a lot of repetitive tasks that I’m just not aware of. And I guess maybe whether it’s laziness or something else, I have decided that rather than try to identify those repetitive tasks, I would go and look at the tools and do what you say, “What’s the job to be done, what can these tools solve? How can these tools make things better?” And using IFTTT, if this then that, if you just go on there you will see thousands and thousands of helpful automation -what they call recipes – to help the services that we use work better with each other. Whether it’s Dropbox or Evernote or my android phone. Just being able to scroll through those recipes lets you see here’s how other people have solve problems and in the past I’ve been able to look at that list and say yeah, these are things that I have a problem with it and maybe these are recipes that I’d like to try out. Similarly, in working with a Mac as my home computer these days, there are several automation tools that are good. Hazel is a great automation tool, Alfred, Keyboard Maestro, are all tools that can simplify and automate a lot of the things that we do. So my goal is to actually to try to learn to use these tools better to find ways to automate the way that certain things work between the services that I use, oor in the way that I interact with my computer in general. Tom Mighell: I will wish you the best of luck on that resolution because that is something that I’ve been wanting to find and have for a long time, is to have the dashboard and there was a period of time where there were a number of dashboard tools that were out there that allowed you to just create different modules for the page and put your email there, and a calendar, and the latest news and it would be the Daily Me and most those tools – to my knowledge, anyway – have really faded away, so I will be very interested to hear what you find because I would love to use something like that. Now my revisiting is a little bit different and I’ve taken a lot of the same themes that Dennis has had for his resolutions to come up with mine or to fit mine into it and the theme of revisiting something new. My resolution is to actually get back to write more content. I’ve been writing a blog now for over 12 years and there was a time that I was writing a post every single day and writing significant content for that blog. Thousands and thousands and thousand of posts, and then life got in the way, and time, and I just didn’t feel like writing all that often. And the content on both of my blogs almost completely dried up. It just became easier for me to not to write something on a regular basis. But I’ve really found that the consequence of that is that when I do write, it’s harder to get started writing, it just feels like more of a chore, it doesn’t come naturally like I used to.I think that to be a good writer, I think a person needs to write a lot; no matter how much they write, they just need to keep writing. And so my goal over the next year is to write a lot more on my primary blog, which is the Inter Alia blog, I’m going to try to do a lot more writing. I’d like to post two or three times a week, I’d be satisfied with twice a week, I’d like to try to do it three times a week. And this resolution really has some tough consequences as well because what I’ve realized is is that a couple of years ago I started the iPad for Lawyers blog with the idea that I would just post iPad content there, and other technology content on Inter Alia. And I think that in part is responsible for why I haven’t been all that prolific is just the thought of having to keep up content on two blogs is too much. So I think that I’m going to be closing down that iPad for Lawyers blog. I can still post the content on Inter Alia, I can still post it on my regular technology blog, it’ll be just fine. But I think that’s going to help get me past that writer’s block that’s been preventing me from from creating that kind of content. So that’s my goal; my goal is to write more, to be involved more; I think that to a certain extent that’s being present more out on the internet, whether you’re using a blog or social media or video or other tools to do things. And it’s just my goal is to try to find a way to be more present and to get more of the stuff that I’m thinking and want to talk about out there more often. Dennis Kennedy: You gave a really nice example of my notion of pruning there, Tom. So resolution number four and final, for me, is I want to try some completely new technology – at least completely new for me – and I think that’s going to be the kind of obvious one but I’ll phrase it in a little bit of a different way. I’ve become really interested in intersection between technology mobile, computing sensors and the human body. So how could technology help us in some of the things we’re trying to do with health fitness, nutrition, those things. So I think that the obvious resolution is to buy an Apple Watch, which is probably an easy resolution for me to keep. But I also heard a podcast last week, the owner of a company called Muse – website is called choosemuse.com – and it’s a device that allows you to analyze your resting and active brainwaves. I think that taking a look at what technology can do in connection with the body and using sensors, I’m not one of those people who wants to go fully to the whole quantified self-notion, analyze and record everything. But it’s really interesting to see how the technology that we originally thought was just say, a better mobile phone, kind of becomes this science-experiment package or different ways that you could use the device. Tom Mighell: I went to go look at that, and again, I will be very interested to see how that turns out because it looks interesting to me, but I got to tell you, I just need to know more about it so I’ll be interested to hear back a report from you on what you’re going to do. Well in terms of what I will be doing completely new this year; I actually started that today. I actually did it today, I went out the day that we were recording this podcast, I went out and bought a Windows Surface Pro 3 Tablet. I did this for two reasons: I want to see if a tablet-type device can replace my laptop; I want to use this as my work laptop going forward rather than the laptop that I have; because that’s what Windows is saying. Windows is saying the tablets are good enough to replace your laptop and I want to test out that theory. I also want to add another platform to my repertoire and I say platform because a Surface is at least partially Windows but it’s also Windows mobile, and as we know and as we’ve talked about before, I’m kind of living in multiple-tech worlds with Android and Mac and iOS and Windows and now Windows Mobile. I know that – Dennis, this may come as a surprise from the guy who wrote the iPad books – but I really want to be a fair judge from both perspectives. I hear people say that this is a better option for lawyers who want to be able to have a tablet alternative to the laptop and so in the coming year, I’m really going to be learning a lot more about using a Surface to see if that claim is true. Dennis Kennedy: Well why don’t we wrap up, Tom. My thoughts on these resolutions is I think it’s useful a useful way to structure things. Like you, I think it’s really important to learn something new about technology every year; I think that’s essential so you can build that into what you’re doing. I also think to take a look at the results that you want to achieve where you can alleviate some pain points and then also a look at that the notion of resolutions as a process to say okay, can I break this down into steps? Are there ways to measure specific? Can I track two specific results? I may have the bigger picture like I use but can I actually break it down into pieces that I can track really well and I can feel like I’ve accomplished. And then also can I use – as in my case – to use something else integrated into something else that I do like my to do list so it comes up on a regular basis as something that I’m working on over the course of the year rather than just say I’m going to lose weight; the typical things that never get done. Tom Mighell: Well I have two tips and that first one kind of ties in with what you’re saying which is really commit to a schedule. Don’t just say this is something I’m going to try to work on, really commit to actually doing something about it on a regular basis and depending on what that goal is, you know the schedule will be different, but really try to commit to schedule and then take advantage of leverage tools that can help you learn more about something. I have been using Lynda.com for the past couple of months to learn more about Access and I’ve got to say it’s really a great tool. It’s a very useful and easy-to-use tool for learning more about different software products; and there are thousands and thousand of courses on just about any kind of software product that you might be interested in learning about. I really recommend using a tool like that. So having that tool as a backup I think is a good way to learn about a product. Tom Mighell: Alright, before we move on to our next segment, let’s take a quick break for a message from our sponsor. Advertiser: Looking for a process server you can trust? ServeNow.com is a nationwide network of local, prescreened process servers. ServeNow works with the most professional process servers in the industry. Connecting your firm with process servers who embrace technology, have experience with high-volume serves and understand the litigation process and rules of properly effectuating service. Find a prescreened process server today. visit www.ServeNow.com. We’re glad you’re listening to Legal Talk Network. Check us out on Twitter, Facebook and LinkedIn too. Dennis Kennedy: And I’m Dennis Kennedy. We thought it would be fun to revisit our own personal tech resolutions from last year and look what we actually accomplished in 2014. It’s good to acknowledge your successes every now and then to keep you motivated, right Tom? Tom Mighell: That’s absolutely right, I went back and looked at our episode last year at our tech resolutions episode and I had two primary resolutions that I’m happy say that I accomplished them primarily, most of them. The first was to learn the Mac and learn to work on multiple platforms. I can say that I got a Mac in early January of last year and I have been loving using that; and like I’ve said a few minutes ago I’ve been living in a multiple-platform world and it’s given me a greater appreciation for how to access information; how to get to it so that it’s available no matter what platform you’re on, and I think that’s worked out really well The other one was in line more with my job and it was to get a certification in privacy and the international association privacy professionals offers certification and I actually got my my foundational. I passed my foundationals test in privacy and I did get certified this year in European privacy – believe it or not. I have been giving a couple of speeches on European privacy because of the new changes over there. I am still working towards my American, U.S. privacy certification; but I did get a significant way through this year so I’m pretty pleased with my progress on those resolutions. How about you, Dennis? Tom Mighell: But you could still duck them, I wasn’t saying anything one way or the other. Dennis Kennedy: So they were revamping my website to take my backup to the next level and to really become a good user of Evernote. So website revamped, mobile-ready, very pleased with how that turned out. Still have to get some content updated, but in terms of taking care of the issues there, making me feel like I have a modern website done. Very reasonable, really enjoyed working with the guys who did that for me. The other thing is an interesting thing about resolutions when Tom and I were talking about this; I was talking about taking backup to the next level and I sort of see that as a remind which turns out to actually be the last piece of the backup puzzle for me. So I would say wow, backup was something I never got done because I would keep seeing this reminder to add another online backup service. But in terms of what I actually did in a way of backup by editing another harddrive, time capsule, a Dropbox professional account, an iCloud increased storage, all of those things. Actually I really, reflecting on it, basically accomplished what that resolution was although until today, Tom, I sort of felt like a failure on that. So that’s good to revisit those resolutions again to think about what you’ve actually accomplished. And then the Evernote thing was interesting because I started using Evernote to try to dive into it to do some stuff with David Allen’s getting-things-done approach. And because it didn’t work with me, I moved over to actually try omnifocus and that was such a huge benefit, sort of my big win of 2014. So the way that that Evernote resolution morphed over to be omnifocus, I think was a big win. So I think that my lesson from there is that it’s okay to take a resolution that might be a little of vague at the beginning of the year, and follow it to where it leads and where you end up might be an even better place than where you’ve started. So now it’s time for our parting shots at one-tip website or observation you could use the second this podcast ends. Tom, take it away. Tom Mighell: So I’ve been reading articles lately on the website medium where people are using more and more often to write thoughtful, really interesting articles on different topics; and there was one that caught my eye, written by a non-techy person about technology, and it’s an article called Email Habits: How to Use Psychology to Regain Control and it’s a guy who wrote a book called Hooked: How to Build Habit-Forming Products. And he’s basically applying some of what he’s learned on how habits are formed to suggest ways to get better control over your email. You may agree or disagree with some of the practices that he’s recommending here, but I think it’s an interesting, different, non-technology way to look at the problem of email; it’s called Email Habits: How to Use Psychology to Regain Control. Dennis. Dennis Kennedy: And I decided to point people to the 2014 Blawggie Awards, and these are a set of awards as I’ve unleashed on an unsuspecting blogosphere 11 years ago when I had the idea of, “Hey, I have a blog, all these other people are doing these awards thing, there’s nothing to keep me from posting my own awards.” So 11 years later, I’m still doing it and it’s highly opinionated and I try to tip the hat to blogs I actually read and really enjoy. So it’s a way to do a shout-out to people that I really like who I think are doing really good work to show some of the new blogs I’ve discovered during the year. So I recommend it, not so much because it’s an award, it’s not like anybody actually wins anything that I give them, but it gets a great response every year and I think it’s a really useful way for people to see the blogs that I actually read and maybe find some new good ones for yourself. Tom Mighell: So that wraps it up for this edition of the Kennedy-Mighell Report; thanks for joining us on the podcast. Information on how to get in touch with us, as well as links to all the topics we discussed today is available on our show notes blog at TKMReport.com. If you like what you hear, please subscribe to our podcast in iTunes or on the Legal Talk Network site. You can also get to our archives of all of our previous podcasts in both places as well. If you have a question about an episode, if you want something answered, or if you’ve got a topic for an upcoming podcast, please email at [email protected] or send us a tweet. I’m @TomMighell, and Dennis is @DennisKennedy. So until the next podcast, I’m Tom Mighell. Dennis Kennedy: And I’m Dennis Kennedy and you’ve been listening to The Kennedy-Mighell Report, a podcast on legal technology with an internet focus. Help us out by telling a couple of your friends and colleagues about the podcast.